Forgive me if you have heard this story in person over the last few months. It’s time for me to write it down. First, we need to set the scene. It must have been late 2000, early 2001. For those of you who weren’t around here then, scrapbooking supplies weren’t so easy to come by in merry olde England. When any scrappish girl found some supplies, she would first buy as much as she could justify, then immediately inform the few members of UKScrappers, which was then a tiny Yahoo group, so they could go buy up the rest of the goodies. From time to time, we would all go ‘crazy’ and buy a box of supplies from the states. But most of the time we would just craft with what we had and keep our eyes open for the next great find. I moved house around that time and my entire crafting stash fit in two medium sized tupperware boxes. Seriously. Yet I was scrapping any time I had five minutes to spare. Then there was the moment I saw the special paper. It wasn’t just 12×12, which was special enough. It wasn’t just acid-free, which was special enough. 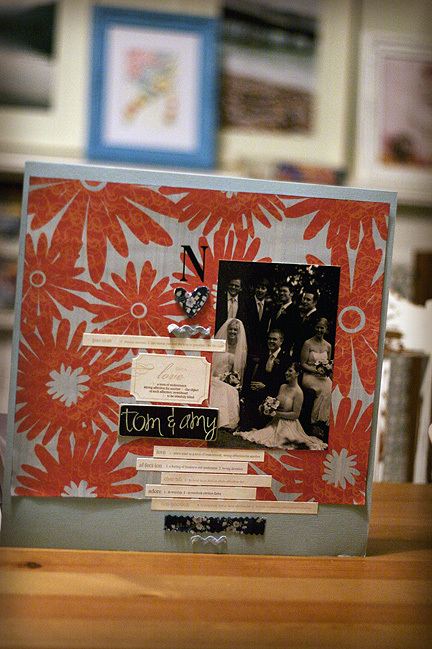 It was 12×12 acid-free printed and embossed scrapbooking paper. Oh my goodness, I about passed out in the store. Everyone who was scrapping knew this paper at the time. It was the paper to buy. If you could find it, you must have had the gift. It only existed in a few special places, and wherever it did exist, it was priced at £2.50 a sheet. So when I found it and it was only £2 per sheet, I looked over both shoulders to make sure there wasn’t a crowd of scrappers running in to buy up all the special paper. And then I bought ten sheets. Ten sheets! Ten sheets at £2 a sheet when I had no idea what I was going to make with it and I really should have spent my £20 in other more practical ways. But this paper was just so cool and it was on sale, so I figured that crowd of scrappers could arrive any moment and I bought it up before anyone else could get to it. For several weeks I kept it on the top of my paper stack, ready to become a masterpiece. I put every photo in my collection next to it, and each time I went for something else because that photo just wasn’t special enough for the special paper. The special paper demanded something…amazing. Weeks turned into months. I still didn’t find the photo that would special enough for the special paper. Much less ten special photos. Since I had ten sheets of the stuff. Since I bought it like it was going out of fashion. Now those ten sheets of paper serve as a reminder for me: use the stash while you still like it! Otherwise you will realise that you really should have put that £20 toward your student loan at the time and not ten sheets of paper that you would take through several house moves, clinging to it for no other reason than “I spent £20 on this and I sure as heck ain’t gonna throw it away”. Now aside from those ten special sheets, I have found new homes for many sheets of paper recently. I’m not quite sure why I had so much paper stacked up that I didn’t like and was never going to use, but I did. It felt wonderful to free it up for people who would appreciate it. But old stash doesn’t always mean ugly stash, so I also have a rather large stack of papers and embellishments that are not the latest and greatest, but I still love them. And I don’t want to get to the stage where I don’t love them before I use them. So this is my new routine. I splurged on the Designing With calendar this year. Haven’t had one in ages and just decided it would be a treat. Every morning when I get up, I’ve got an instructional manual on doing a quick page for myself, just by looking at the new calendar page and following the directions. The process helps with the fact that I am not a morning person by forcing me to just get going with the cutting and the sticking. And to shake it up to fit my needs a little more, I have to start with the big old stack of old stash. So day by day, I get pages that are just for me and I use up the supplies I spent my hard-earned pennies on, so I will never again have the guilt of the stack of special paper. That’s all. It’s not rocket science. And the pages I’ve made so far aren’t the most fabulous works of art in the world. They are not my sit-down-and-journal-for-half-an-hour routine. They are simple and quick, which is what I need in the morning. They are a mix of old stash (and my stash has levels of old) and new stash that will stretch to more than one layout. Because the thing that annoys me most about my supplies is that just because I use it doesn’t mean I get the space back. You buy a sheet of stickers and use up even half or three-quarters of the sheet…it’s still there and it’s still the same size! Books of rub-on letters…they never get any smaller. You can get to the point where you can’t spell anything because you’ve run out of vowels and you’ll still keep the whole book because it might come in handy for a mixed-up title. But I have to draw the line somewhere. These rub-on letters that I used on this page were so crackly from being carted back and forth to crops in the bottom of a tote bag. It’s use ‘em or lose ‘em time, and I know I’ll feel a lot better if it’s the former. So there we go. It’s not particular a resolution, but a new little bit of routine…and a little more routine and a little less special paper probably won’t hurt. Next post: We are here. How bizarre. I am doing exactly the same thing to get through my ‘100 layouts , no stash purchases’. Great minds and all that. I love that story! We all have some supply that we hoard like that…crazily!!! I love your resolutions! What a great idea. And I can so relate to your special paper story. Thanks for the inspiration to use (a) my past Designing With calendars, and (b) my older stash! What a wonderful post! I have lots of ‘special’ papers. I am feeling the need to go use them now! I so know what you mean! I had a stack of gorgeous paper here that I knew I loved, but there’s was no way I could use all of it just for scrapbooking (I’d be 100 years old before I used it up!) So I did the next best thing – made handmade cards using the papers. Then I wrapped them up into bundles of 20, and gave them as gifts for Christmas! Oh, the special papers! How I’ve been there. LOL. Now that’s a story any scrapper can relate too! Love your solution using the DW calendar. I have last years and have decided to reuse it this year. The dates are the same, right? I shrank in my chair in shame. My name is kymmie. I hoard “special” stickers. I have been cleaning out my scraproom on my winter hiauts. I put a lot of ugly paper in a box, some stamps I will NEVER use and intend to give it to the art teacher at my elementary school. I keep telling me all the time that I need to use my stash and spend less on new supplies… it’s difficult but hope to acomplish it!! I’ve been doing your Journal Your Christmas class (and LOVING it) which has prompted me to use more of my hoarded supplies than ever. I’m trying to keep to the philosphy that if I was hit by a bus tomorrow (God forbid) would I rather leave behind beautiful and heartfelt scrapbook projects or a pile of scrapbook papers and embellishments? I love this idea, and think I shall sit my self down and use my calendar and old paper. Mine’ll have to be evening projects though as 6:30 is too early as it is and I have to be in work by 8! Thank you for the inspiration to use old stash!!! Lol I think I have heard that story before! Oh wait, I live that everyday!! Beautiful page also! I first found scrapbooking on holiday in the USA in 2005, as can only be expected i spent all the money i had taken with me to get a new winter wardrobe on special papers…..there’s lots left, especailly the super special ones for stroking only. i will get them out and use them now! How true. I think everyone who scraps can identify with your post. Thanks for the inspiration. Its Charlie and Holly here from your old class just want to say we really miss you and we want you back BADLY! We have Miss O’Conor now. Luv you loads miss you were an inspiration to us and grays. Hi! Love the story and I want you to know that I used a ton of my stash in my JOURNAL! I finally finished it. http://pinktearoses.blogspot.com/ Thanks so much for a great class! shimelle, you need to use those papers to scrap that story! I love it…I even have a box of old stuff that’s packed away out of sight…I might just have to get it out now! Great story. I picked up a couple of sheets from your free stash at our crop on 1st December – & as one of them was a ‘Snow’/winter paper, I used it on a couple of my journal your christmas layouts – a great reminder!! ‘Special kind of ugly’ rofl! I think I have some of that paper somewhere too. And for all you American Gals—Please note that 20British pounds = $40 American Dollars. Yikes! Lesson well learned. Thanks for sharing!! OMG that is sooo me. Except my problem is that I love the paper so much that I dont want to use it..because God forbid I use the wrong picture, or I screw up, and then my perfect “pedastil” paper is no longer in my cabinets to drool over! I need to get that autumn leaves calendar! I have seen it..every page..and love it..but not BOUGHT it yet. that is me right on!!! OMG, this is so me! I’ve got a large stack of paper in my lot, just thinking about using them ALL up stresses me! Could be any one of us <LOL> I bet I have some of that paper too somewhere! Lovely story -beautifully told – thanks for sharing! Three years later, and this article is as wonderful as the day you wrote it. So true and so important. Wow! I have so much paper that has fallen into the ‘only use on a VERY special layout’ category, that I too, now have a stash full of ‘Why did I buy that’ paper. I am beginning to clear some of it, and have actually found that it is both good for the soul and, surprisingly, good in the scrapbook. I can really relate to this. I have a large stack of hideous bible thing papers that I got when I started scrapbooking on 2004. I cannot bare to part with them but they are so ugly laughs Nowdays I try and use my products or at least break into them asap, like the night I get them. Still I have a problem with pretty paper. 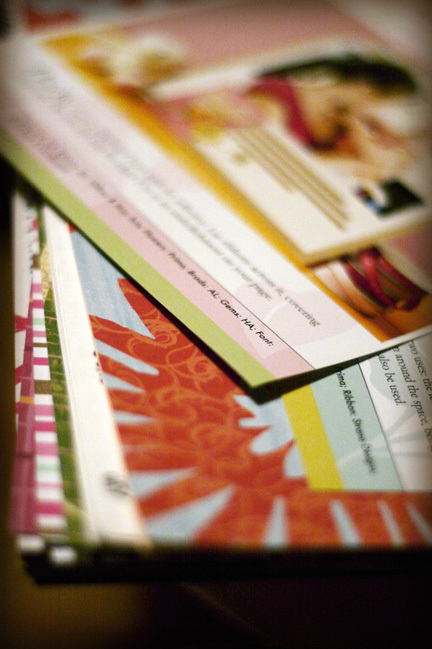 I have a whole stack of Chatterbox papers that I adored and was ‘saving’ for special layouts. Now I wonder what the heck I ever wanted them for, I really don’t like them but invested a small fortune in them, wish they would come back in style, ha ha. Feel the same way. Have some stash from back near 2000 but it’s really the newer stuff that is neglected. Too special to use until I have just the right photo. Doing PL hasn’t helped. Cool stuff if way to good for that.